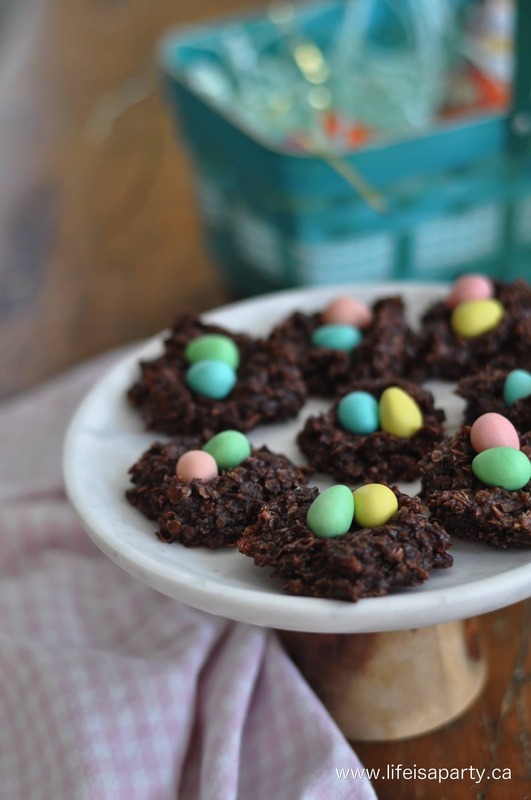 Chocolate Coconut Macaroon Nest Cookies: An easy no-bake cookie, perfect for Easter, made to resemble little nests and full of Easter eggs. 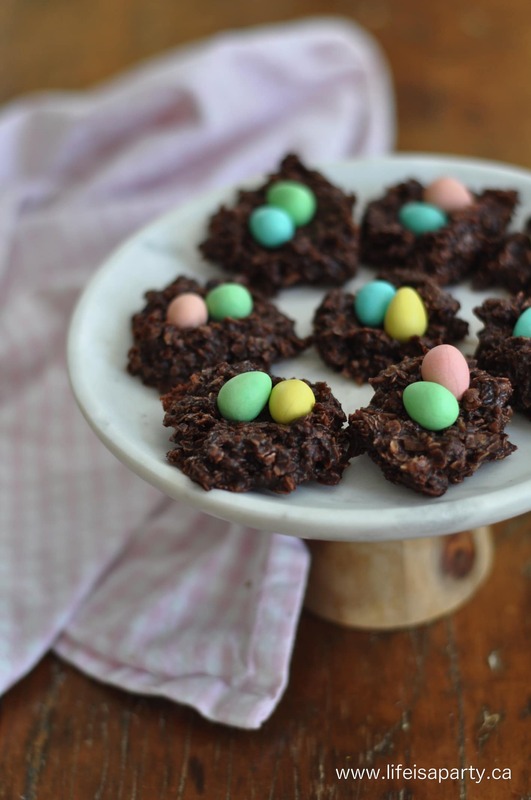 These Chocolate Coconut Macaroon Nest Cookies are an old family favourite. I grew up on them. My mom called them Chocolate Drops, they’re sometimes called Macaroons, or No-Bake Chocolate Coconut Cookies, or Chocolate Coconut Macaroons. Whatever their name, they’re delicious. My mom always made them plain, often on a weeknight after dinner since they’re pretty quick and easy, so we could take some to school the next day for our lunch. I have many memories of opening up my wax paper package of these at recess for a real treat. I like making them in the spring and for Easter with the addition of some little Easter eggs that make them resemble the sweetest little nests. In a large mixing bowl combine the rolled oats, cocoa, and coconut. Set aside. Combine the sugar, shortening, milk and salt in a saucepan. Bring to a boil and boil 1 min, no longer. Remove from the heat and add vanilla. Then stir in the dry ingredients that you set aside earlier. Stir well and quickly to combine everything. While the mixture is still hot, drop by tablespoon full onto parchment paper or plastic wrap spread on a table. The mixture will be hot, so use two spoons, or dip your finger in cold water in-between cookies. Be sure to work quickly before the mixture begins to cool and harden. While the cookies are still hot, press a few eggs into each. Allow to set completely and enjoy. Store in an air tight container. Makes about 3 dozen. These are the perfect addition to any spring or Easter get together. And your kids will love them. 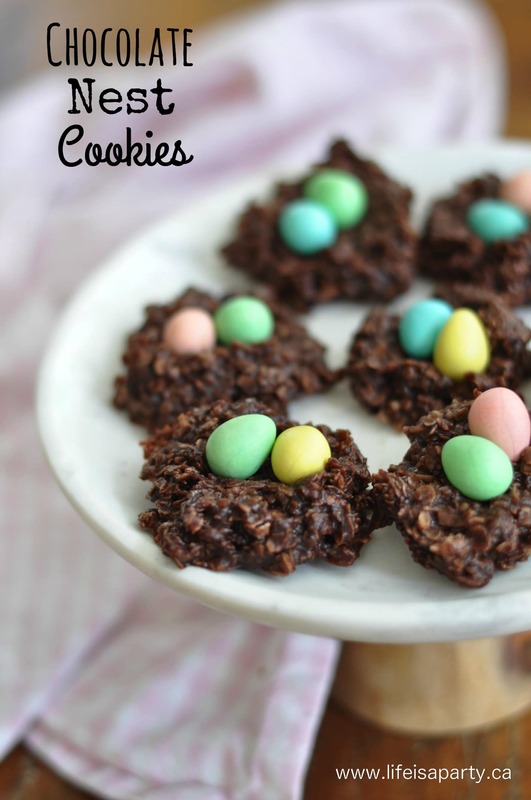 With easy homemade Chocolate Coconut Macaroon Nest Cookies, life really is a party! 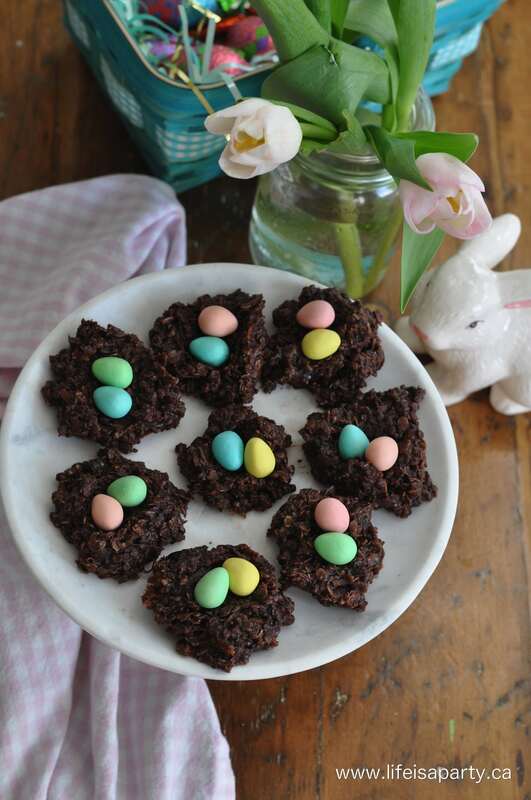 Want another easy Easter recipe? 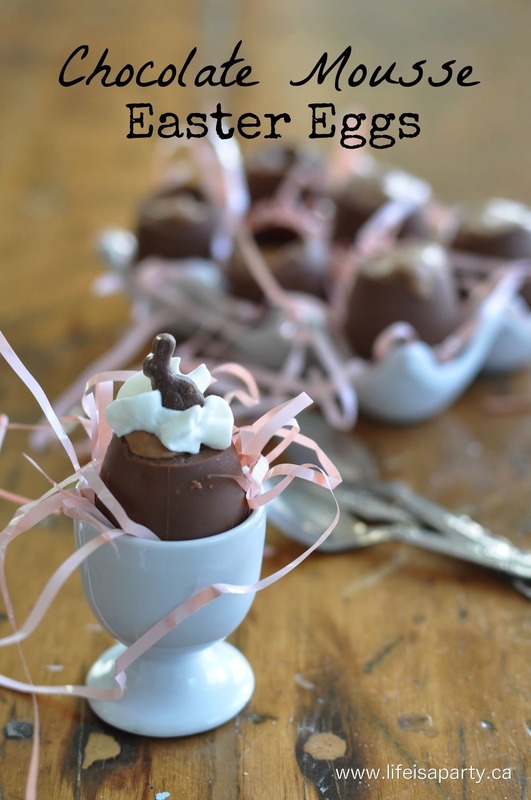 Check out these Chocolate Mousse Easter Eggs.